Disclosure: This post is part of a sponsored campaign for Snazaroo. I received compensation for my participation, but my review and opinions are my own. Halloween is quickly approaching and the costumes are bought. What's left is the face that we'll be painting on our little sweet hearts. 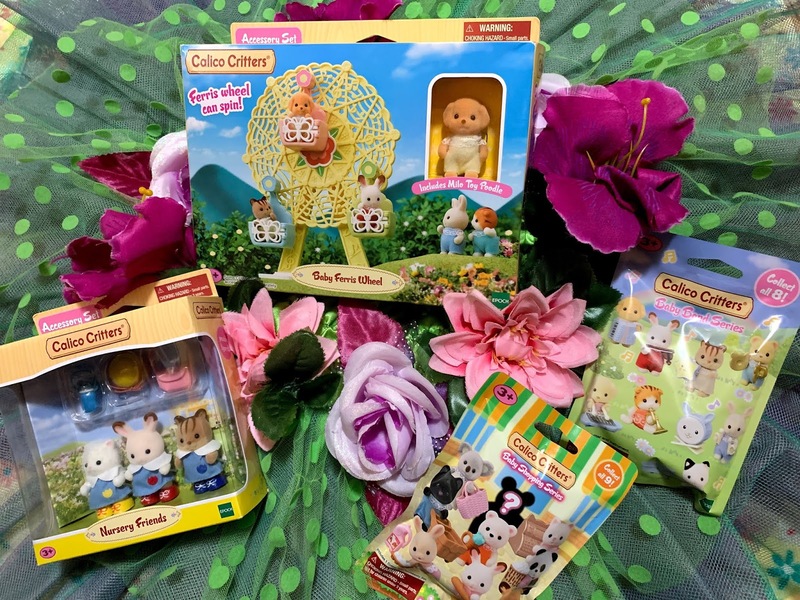 From silly animal masks to full on transformations, there's only one brand I trust to keep my MiniBoo's face safe under all the colors and that's SNAZAROO. 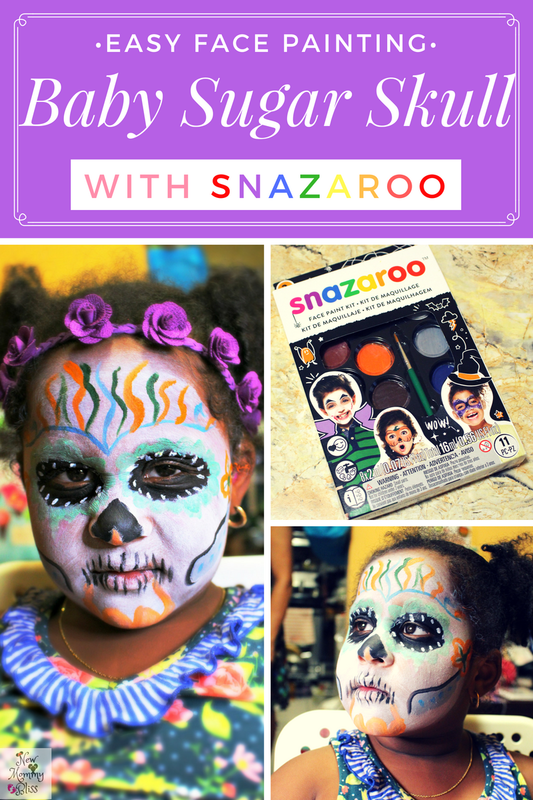 Allow me to give you an Easy Sugar Skull face painting idea and tell you all about Snazaroo. 1) Start off with Painting the child's face completely white with a face sponge. Leave the area around the eyes without white color since you will color in the eye area with black or any other color of choice. 2) Use a small brush and black face paint to add the details of the nose, cheek bone, and touch up around the eyes. 3) Mix any dark colors with white to make the colors lighter or leave them as is to keep them bold. Make "flower petals" around the eyes to make them pop! 4) Use other colors to make floral line designs and more. Use white paint and small brush to add dots wherever you'd like. 5) Add flower petals on the chin and Voila... We are done! Keep in mind that Sugar Skulls face painting can be made using any combo of colors as long as you keep the "Skull face" present! Snazaroo.com, features terrific, step-by-step printable tutorials on a broad range of fun, Halloween looks kids will love, from aliens to zombies. It includes designs for popular animals, seasonal themes, princesses and fairies, pirates and heroes and of course, Halloween and horror. If you're wondering about the clean-up, don't fret! It only took 4 really moist wipes to wipe it off. 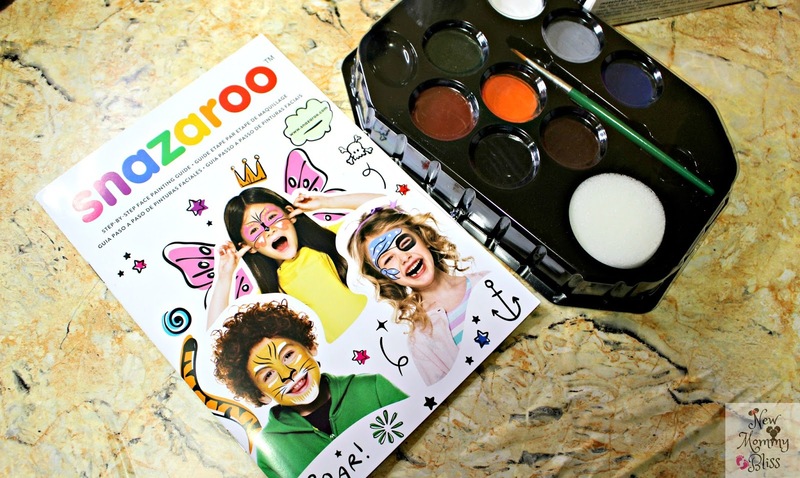 I highly suggest you order your safe Snazaroo Face paint for kids before halloween or even parties happen! Tell Us: What's your kid going to be for Halloween? That is adorable!! I love it! Perfect for halloween! You daughter is adorable by the way! This is so cool! 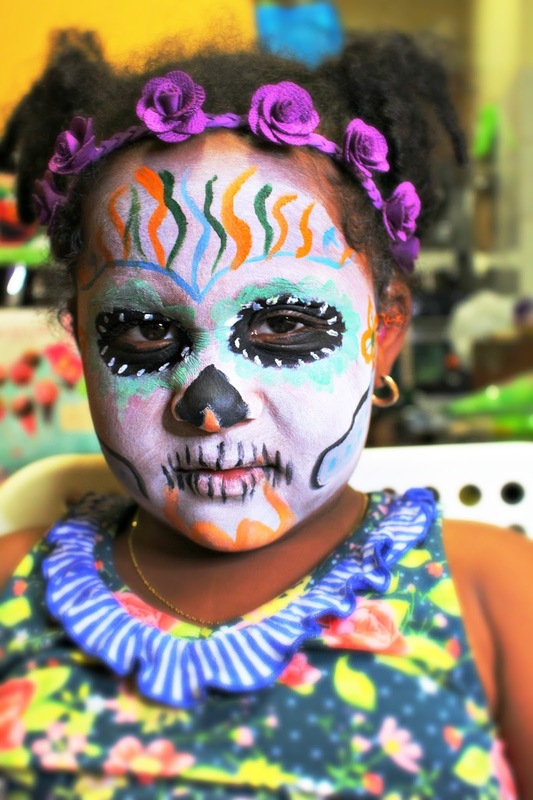 My kids love having their faces painted and I love the Day of the Dead theme. My kids love doing face painting. This looks like a fabulous kit to do it at home. Halloween is one of our favorite holidays of the year. This is too cute and what a great and easy way to get you little one ready for Halloween! !1 I love that you used different colors to accent the eyes. How cool is this tutorial! You make this look so easy to accomplish! My daughter would love this! Face painting is so much fun, especially for Halloween. It can really help a costume look better and more realistic. This is a really cute design. I love the use of color! You can be super creative with Snazaroo. You did a marvelous job! Having a printable tutorial would be fantastic resource, I'm sure I'd have to practice a few times! This is such a fun Halloween idea! The face paint turned out looking so great! Aww - so cute! The set looks super easy to use. Will have to pick one up for my neices and nephews! Wow that is super cute. We tried face paints last year for Halloween and I did a pretty cute tiger on my youngest son. I must admit, we need to get some more face painting gear - will look into this brand! Cutest Scariest skull face around! :) :) Love it! She looks so adorable! I hope she's going as this for halloween! what a great product! It makes me nervous to put things on children's faces, but with this review I feel more confident about choosing snazaroo's! Oh wow!! What an awesome face painting set!! 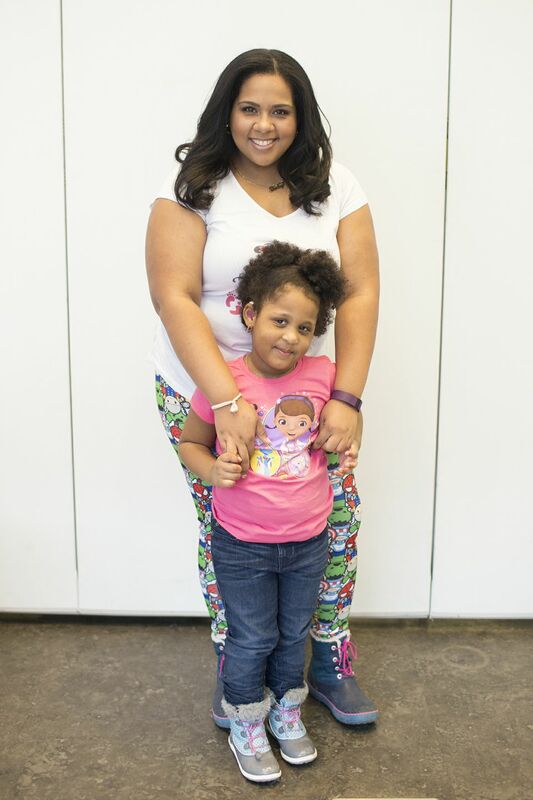 Your daughter is super cute!! You are artistic. It seems like she is enjoying it too. Oh my goodness how fun and cute. I'm not sure I could do a good a job as you but I'm willing to try. Love this set and I know the grand kids would too. Omg how awesome!!! This definitely takes some talent!!! I wonder if I could pull this off!